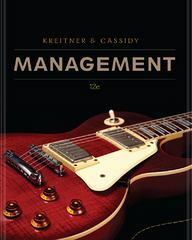 Management 12 Edition MANAGEMENT, 12th Edition takes a practical, student-oriented approach toward teaching management with an emphasis on current topics, including issues of diversity, ethics, and technology. The student-friendly content features references to pop culture and cites current publications of interest to students. In addition to providing the management framework and introducing students to contemporary management topics, the text provides experiential activities to get students thinking and acting like real-life managers. A robust network of supplements helps students to understand the hands-on, real-world application of chapter concepts.